In the UK more than 49% of the population experience back pain in any given 12 month period; approximately 90% of these episodes will fix themselves within 6 weeks 4. Nonetheless, pain conditions lasting longer than 3 months (chronic pain) are becoming increasingly difficult to treat and the choice of drug combinations provided in general practice can vary according to the type, location and a patient's personal attitude toward pain relief. The general rule is to provide pain relieving analgesics at the lowest level appropriate to the patient's pain, and then to move on to a higher potency level until the required relief is obtained 5-7. Patients' may climb the so called ‘analgesic ladder' until they reach a point where they may require a strong opioid-type drug before they acquire any benefit in terms of pain relief. Alongside this however they may have fears about addiction, tolerance and the lingering side effects of these drugs. Many are still not receiving adequate pain control and this, unfortunately, has its own set of consequences, not least of which are sleeplessness (65% of pain sufferers) depression (49%), fear and stress 2 8. Lack of sleep from stress has an effect on the regulation of our immune cells and their function, which means that chronic pain can severely affect the immune system 9-11. Stress increases the release of adrenocorticotropic hormones (ACTH) that create metabolic and hormonal changes, further escalating the pain cycle 12 13. Moreover, because chronic pain is known to induce depression there may be further increases in stress levels 14. This continual cycle of stress and pain influences immune suppression through the exaggerated release of pro-inflammatory markers 14-17 which in turn decreases the number of natural killer cells that play a major role in the rejection of tumours and cells infected by viruses 16. Patients often have preconceived expectations of pain, particularly if they have had previous experience of pain either personally or through having cared for someone in pain 18 19. Preconception is associated with negative expectations and when pain control is difficult to achieve it can induce negative attitudes 20. There is no consistency in pain management across the UK and many primary care facilities lack sufficient funding to be able to offer a variety of services. Those that do, are unable to keep up with the number of referrals 2. This may all sound rather complex but the science behind chronic pain is not as complicated as it may seem. Many pain sufferers seek alternative or complementary means of pain relief and reflexology is just one of the many modalities available to them. We all know that reflexology can be an extremely pleasurable experience but were you aware that pain and pleasure are highly interconnected within the dopamine and endogenous opioid systems of the brain? 21-23 During noxious (harmful) stimulation an area of the brain known as the Nucleus Accumbens releases endogenous opioids into the hypothalamus which helps to raise the pain threshold 23. My research clearly showed that reflexology stimulation (which may be perceived as painful by some clients) increases both pain threshold and pain tolerance 24. In addition to the pain relieving effects of reflexology, my research also showed that reflexology produces a decrease in heart rate, which suggests that it may also have a beneficial effect on relaxation and stress, and consequently on the immune function. Whilst reflexology has shown some measureable differences, demonstrating this effect to clients in a meaningful way may be elusive to some practitioners. Understanding the basic neurophysiology of nociception (pain processing) and providing an effective treatment is important for practitioners; knowing how to measure your clients' pain is vital when a client cannot clearly see the benefits of your treatment. Evidence shows that emotional responses are based on motivation and reward 25-27, so in order for your client to truly appreciate the difference your treatment is making, you need to show them. You can do this by measuring the effectiveness of your treatment, based on your clients' feedback and through the use of pain measurement tools. My workshop offers you an introduction to Pain Management, it will cover nociception, the use of scales to measure your client's pain, and an introduction to some of the basic Nerve Reflex Points (NRP) for managing neck and back pain. 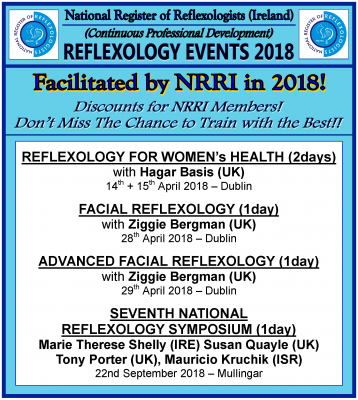 This workshop is also a great precursor for those of you who wish to further progress your pain management techniques with the use of nerve reflex point therapy taught by Nico Pauly, a Belgian physiotherapist and pain specialist. For further information on NRP, visit my website www.reflexmaster.co.uk and follow the link under the Reflexology tab or go to http://www.mnt-nr.com/EN/fiche.asp?itemnr=1471. 1. Niv D, Kreitler S. Pain and Quality of Life. Pain Practice 2001;1(2):150-161. 2. Donaldson L. Pain: Breaking through the Barrier. In: Basler M, editor. Pain News. London: British Pain Society, 2009:21-27. 3. Bandolier. Acute Pain - Evidenced Based Healthcare. Bandolier Extra, 2003:1-22. 4. The Backcare Charity. Facts and Figures, 2014. 5. Dickensen AH. Pain Mechanisms: Introduction to the Neurophysiology of Pain, Peripheral and Central Mechanisms [DVD]: British Pain Society, 2008. 6. Greene RJ, Harris ND. Pathology and Therapeutics for Pharmacists. London: Pharmaceutical Press, 1993. 7. Schug SA. Update on the Role of Non-Opioids for Postoperative Pain Treatment. Best Practice and Res Clin Anaes. 2007;21(1):15-30. 8. Phillips CJ. The Cost and Burden of Chronic Pain. Reviews in Pain 2009;3(1):2-5. 9. Markenson JA. Mechanisms of Chronic Pain. Am J Med 1996;101 (suppl 1A):1A-6S - 18S. 10. Page GG, Ben-Eliyahu S. The Immune-Suppressive Nature of Pain. Semin Oncol Nurs 1997;13(1):10-15. 11. Tang NKY. Insomnia Co-Occurring with Chronic Pain: Clinical Features, Interaction, Assessments and Possible Interventions. Reviews in Pain 2008;2(1):2-7. 12. Ahles T, Cassens H, Stalling R. Private Body Consciousness, Anxiety and the Perception of Pain. J Behav Ther Exp Psy 1987;18(3):215-222. 13. Henry JP. Biological Basis of the Stress Response. Integr Phys Beh Sci 1992;27(1):66-83. 14. Irwin MR, Miller AH. Depressive Disorders and Immunity: 20 Years of Progress and Discovery. Brain Behav Immun 2007;21:374-383. 15. Aggarwal BB, Shishodia S, Sandur SK, Pandey MK, Sethi G. Inflammation and Cancer: How Hot Is the Link? Biochem Pharmacol 2006;72:1605-1621. 16. Irwin MR. Human Psychoneuroimmunology: 20 Years of Discovery. Brain Behav Immun 2008;22:129-139. 17. O'Connor MF, Bower JE, Cho HJ, Creswell JD, Dimitrov S, Hamby ME, et al. To Assess, to Control, to Exclude: Effects of Biobehavioural Factors on Circulating Inflammatory Markers. Brain Behav Immun 2009;doi:10.1016/j.bbi.2009.04.005. 18. Cioffi D. Beyond Attentional Strategies: A Cognitive-Perceptual Model of Somatic Interpretation. Psychol Bull 1991;109(1):25-41. 19. Coghill RC, MacHaffie JG, Yen YF. Neural Correlates of Interindividual Differences in the Subjective Experience of Pain, 2003. 20. Wiech K, Ploner M, Tracey I. Neurocognitive Aspects of Pain Perception. Cell Press (Review) 2008;Articles in press:1-8. 21. Bufalari I, Aprile T, Avenanti A, DiRusso F, Agliotti SM. Empathy for Pain and Touch in the Human Somatosensory Cortex. Cereb Cortex 2007;2007(17):2553-2561. 22. Urch C. Normal Pain Transmission. Rev Pain 2007;1(1):2-6. 23. Leknes S, Tracey I. A Common Neurobiology for Pain and Pleasure. Nature Neurosci 2008;9:314-320. 24. Samuel CA, Ebenezer IS. Exploratory Study on the Efficacy of Reflexology for Pain Threshold and Tolerance Using an Ice-Pain Experiment and Sham TENS Control. Comp. Ther. Clin. Pract 2013;19:57-62. 25. Esch T, Stefano GB. The Neurobiology of Pleasure, Reward Processes, Addiction and Their Health Implications. Neuroendocrinol Lett 2004;25(4):235-251. 26. Ford G, Finn DP. Clinical Correlates of Stress-Induced Analgesia: Evidence from Pharmacological Studies. Pain 2008;140:3-7. 27. Becerra L, Borsook D. Signal Valence in the Nucleus Accumbens to Pain Onset and Offset. Eur J Pain 2008;12:866-869.